So, you hit some great sales today. Your car is loaded with things you couldn’t pass up. You haul them all in to your house and look at them, beaming over the great deals you made. But now what? Those precious items you were so excited about acquiring a few hours earlier are now staring you in the face, all asking the same question. “What are you going to do with me?” Buying was easy, but now comes the real challenge. You now have the chore of finding a place or a use for your new items. 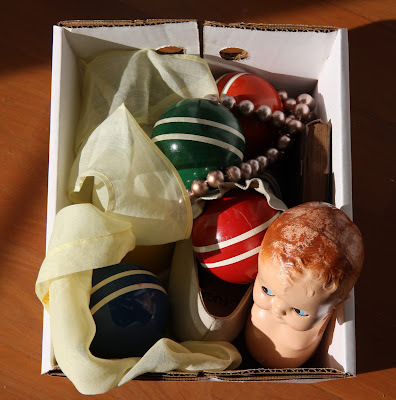 Here is an example of a typical box of items I might acquire on any particular Saturday morning. Let's dump it out and see what we've got. Ok. We’ve got an old apron, some balls from a croquet set (the rest of the set long gone), an odd shoe, a women’s handkerchief, a string of beads, an old book, a doll with only one unattached arm and no legs (couldn’t pass up the cute face, even though she was limbless), and several generic looking small plastic dolls. Like many of us, I buy what I like and figure out what to do with it later. 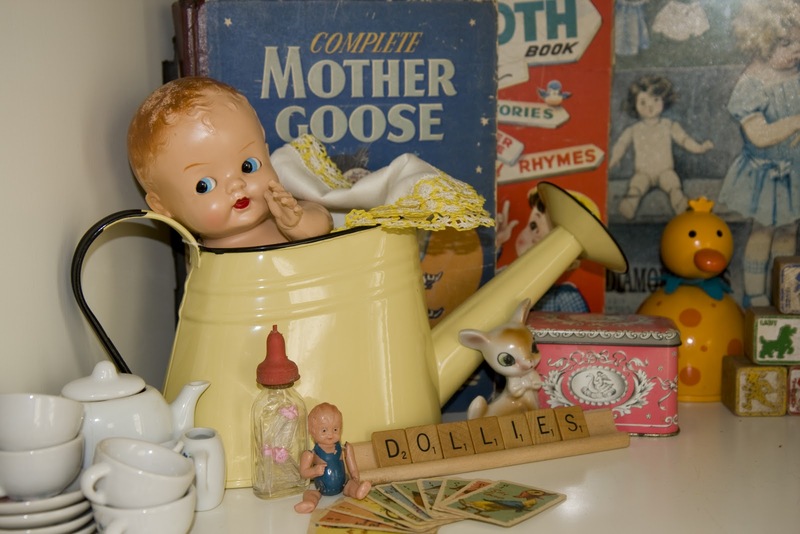 Here are 3 examples of ways to decorate with some of the items in my particular box. The limbless baby. So cute, ... but so without legs and an arm. I decided to place her in a watering can supported by an old handkerchief to keep her from falling over. I made sure to put her on the side where her “good arm” would show, which I gently put in to place. 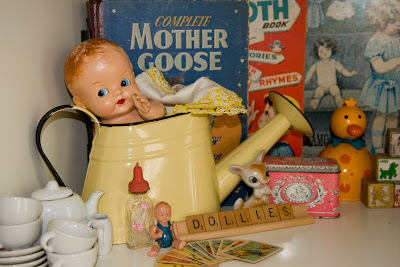 To see more of the room with the appendage-ly challenged baby look under "Kids Rooms". 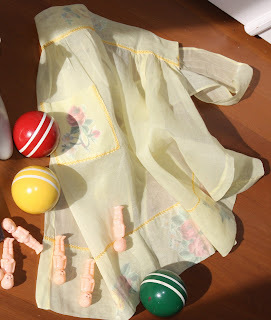 Half a Croquet set. Love the balls, ... very bright and colorful. 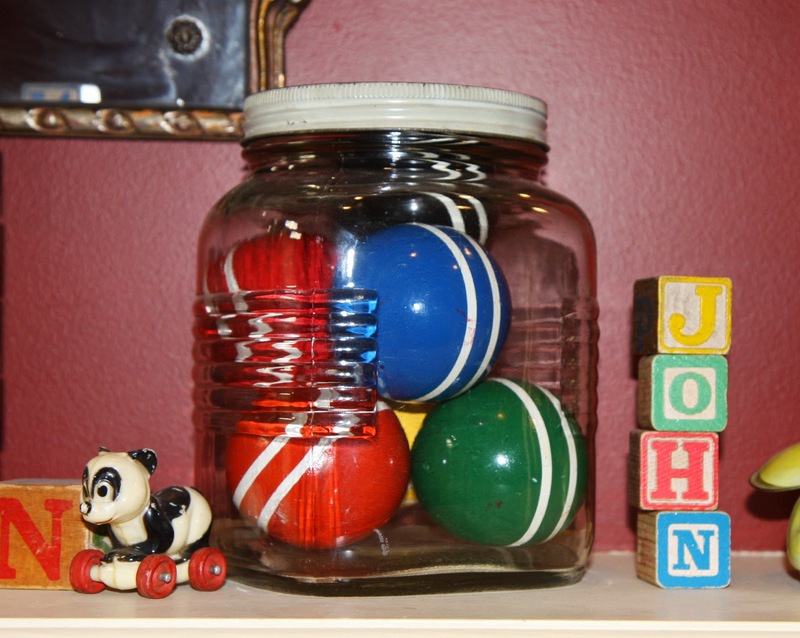 I put them in an old Hoosier jar I found at a previous sale. 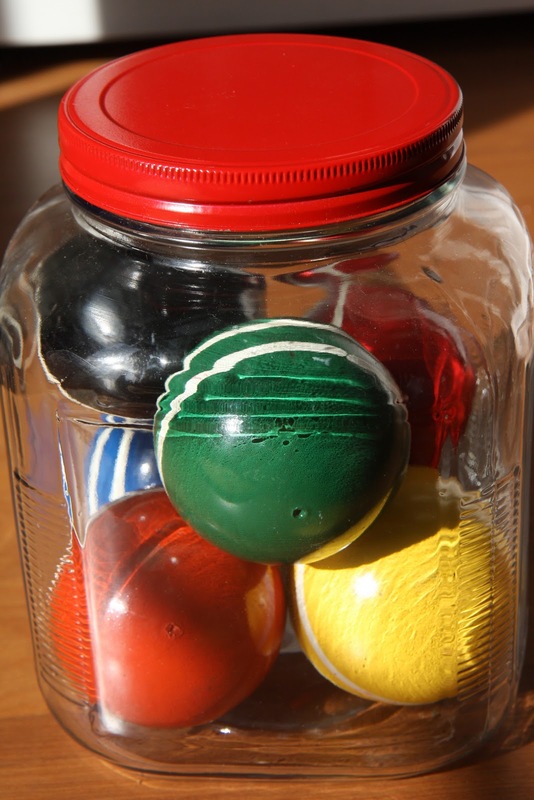 If you don’t have such a jar, there is an easy fix. Target sells new jars that are very similar to the vintage ones. A new jar this size will cost you $5.99. The jar comes with a shiny silver lid that gives it’s newness away. But that’s nothing that a little spray paint can’t fix! 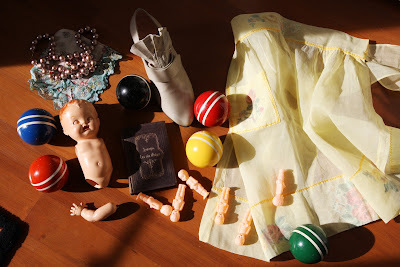 Shoe, handkerchief, and assorted babies. At first there would seem to be no connection between these items. But ideas quickly started swirling in my brain. 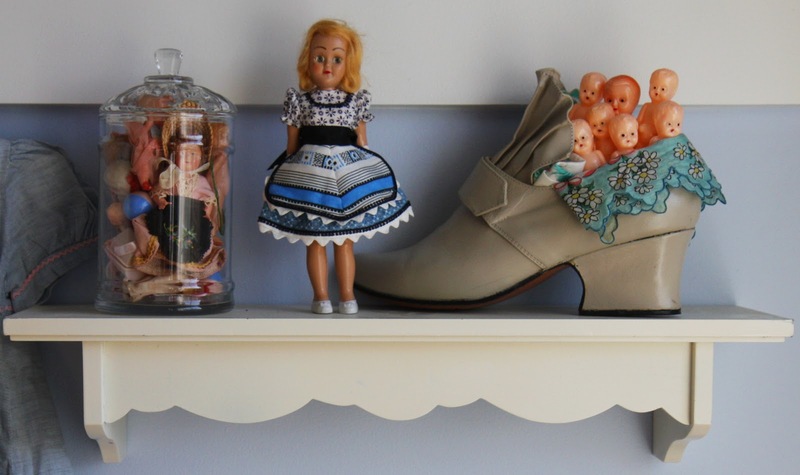 I love nursery rhymes and have a vintage print of the Old Woman Who Lived in a Shoe hanging in my daughter’s room. This inspired me to make my own whimsical shoe full of children. Voila! I’m happy to report that all the items in my box have now found a happy home. And best of all, I have an empty box to fill up next week! Last week I purchased a few Jack and Jill magazines from 1949 & 1950. Inside each of them has either a paper doll, puzzle or game. 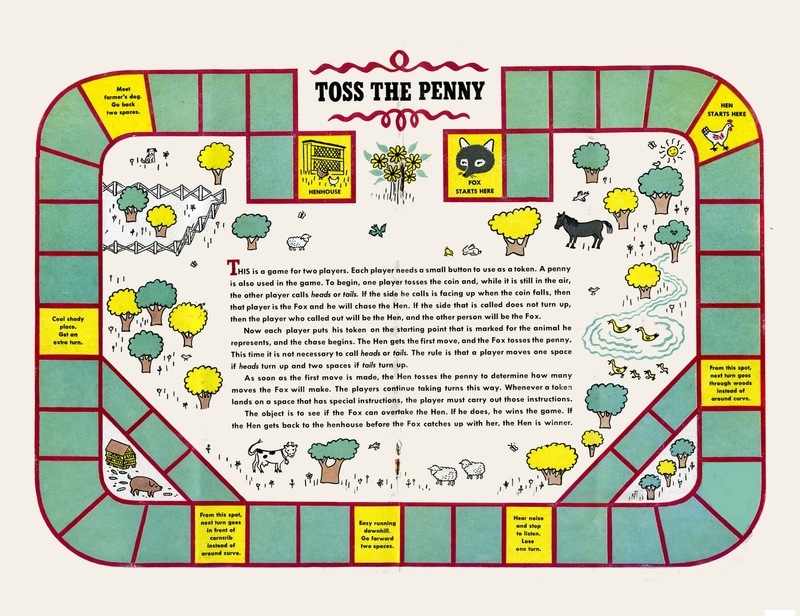 The issue from July 1950 has the cutest little game for kids. I'm going to have my two youngest kids play this after school. 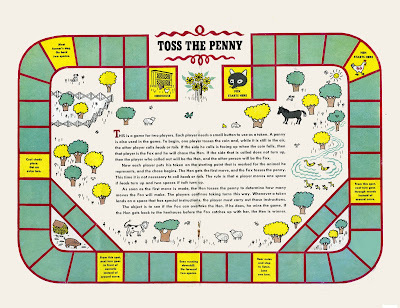 If you would like to play it too, click on the link below and print your own copy of Toss the Penny. 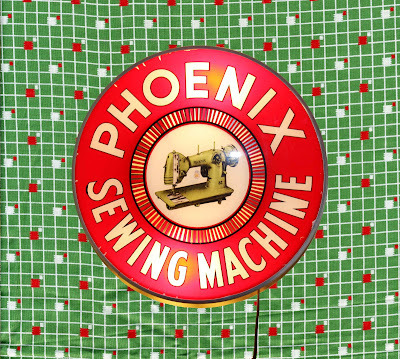 I really love vintage aprons (there's a shocker!) I find myself buying them often at estate sales. Some are great for inspirations for new patterns, others are made from great vintage fabrics, some I actually wear to cook dinner. What I love about aprons is that each one is unique in one way or another. They remind me of a by gone era of simpler times. The kind of life I wish I had now. Here is a typical apron you might come across. This one is made with a sheer fabric and has roses from an old handkerchief appliqued on it. An apron like this would be worn on special occasions to welcome guests to your home. Because it wasn't worn everyday, special occasion aprons are almost always in new or barley used condition. This apron was perfect to complete my own little tribute to aprons. 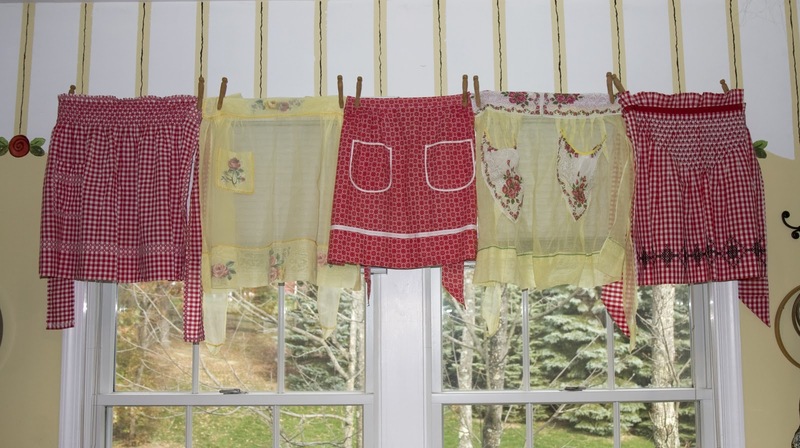 In my sewing room, I made a simple window treatment using red and yellow aprons I had collected. I used the existing curtain rod and used clothes pins to put my aprons in place. A window treatment in 5 min, not bad! What gets me through the week is knowing that Saturday morning (and sometime Friday too) is my Sale Day. I generally spend most Saturday mornings at sales; garage sales, church rummage sales, estate sales, household sales, tag sales, flea markets. Call them what you will, but to me they are just sales that I want to be at. Lately, I have had to cut back on my shopping a bit, as it was getting a little out of hand and I'm running out of room in my house. But last week I was out for a little mental health therapy. While I was at an estate sale Saturday morning, I met Michael. He runs a website called Pittsburgh Estate Sales. It's always fun to talk to people with your same interests. Michael's a great guy. We had a nice visit. I have been on his website several times, so it was fun to meet him. If your looking to go to estate sales in the Pittsburgh area, his site is the place to go for all the info. This week I ended up with some cool, old scrapbooks, a couple of books, a red alarm clock, piano sheet music, a kids table, some old games, and even a few Western Union telegrams from the 1930's. You never know what you'll find. And that's what makes it so much fun! F.Y.I. the fabric in the photos is from Heathers Bailey's Nicey Jane collection. It's the Picinic Bouquet - gold laminated cotton. 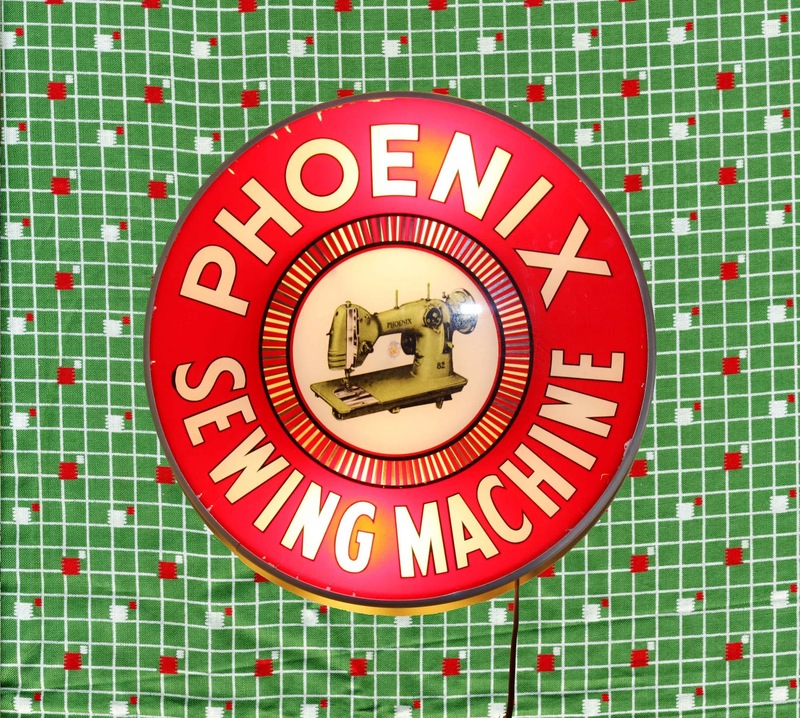 I recently purchased it to make a tablecloth for my kitchen table. I LOVE Heather Bailey's fabric! Her website is my favorite site on the web! If you have never been there you must visit Heather Bailey. If you are a Seinfeld fan, you are familiar with Frank Costanza's method of dealing with stress. When faced with a situation that could make his blood pressure rise, he calls out "Serenity Now". I on the other hand, start projects, lots of projects. Sometimes I even finish them! Making things is my mental health therapy. As a mother of 5, I always seem to be drowning in a sea of chaos and confusion. And when those days are really bad, I retreat to my sewing room and sew up a few things, or redecorate a room, or make some hair bows, or a bracelet, or start writing a book, or go to an Estate Sale, or a flea market.......you get the idea. So here is where I will share all of my little sanity projects. Hope they'll bring you a little "serenity now" too!